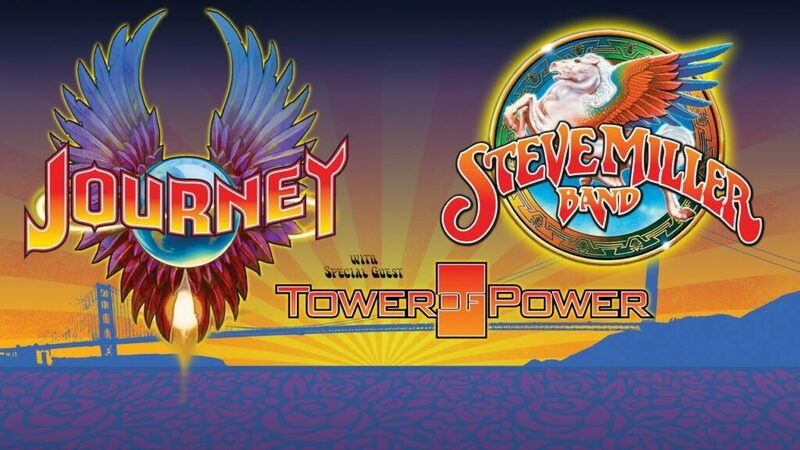 For fans of San Francisco Bay area music, First Niagara Pavilion was the place to be Friday as 1970s stalwarts Tower of Power, the Steve Miller Band and Journey graced the stage. Interestingly enough, the bands’ origins and extensive catalogs are all they had in common, as they all play different styles of music. Mr. Miller and company opened with “Jungle Love,” dropped in key a step-and-a-half from the original, and his lead vocals seemed a little weak throughout the set — of course, he was never a true belter anyway — but the harmony vocals were consistently strong and made up for it. The end of “Take the Money and Run” featured a “piano” solo from Joseph Wooten that recalled Lynyrd Skynyrd’s Billy Powell on “Sweet Home Alabama,” which features similar chord changes. “Dance, Dance, Dance,” Mr. Miller playing an acoustic, had a bit of a country/bluegrass touch; afterward he pointed out that a couple several rows behind me were doing a two-step. That was followed by an unplugged solo set that opened with “Wild Mountain Honey,” which disappointed because the synths and percussion made that song what it was. Things didn’t really come alive until “The Joker,” the audience waving hands, and during “Rock’n Me” about a dozen large balloons dropped into the crowd, which batted them about. The strongest number was the encore “Fly Like an Eagle,” a bit quicker and funkier than the studio version and which gave Mr. Wooten, this time on “organ,” the opportunity to stretch things out. On the other hand, It would be hard to find a highlight of Journey’s show-closing set, which began with “Be Good to Yourself.” The ultimate in corporate rock Journey may have been when it was filling stadiums in the 1980s but, having never seen it before, I was impressed with its sheer talent. Neil Schon did his thing on lead guitar throughout, at one point doing a rousing rendition of “The Star Spangled Banner,” and keyboardist Jonathan Cain played rhythm guitar on several songs. And of course the two “new guys” — vocalist Arnel Pineda, a small man with a big voice; and drummer Deen Castronovo, who took the lead vocal on “Mother, Father” — needed to be accounted for. Somehow I don’t think that the two Steves — Perry and Smith respectively — are missed very much. Unfortunately, due to unforeseen traffic issues, I completely missed Tower of Power’s abbreviated set. That was a drag because I had hoped to hear its new lead vocalist Ray Greene, who replaced Larry Braggs earlier this year.